Jello shots are a staple at many social gatherings; after all, what makes drinking alcohol more fun than enjoying it in the form of a favorite childhood treat? But if you’re really looking to impress your guests at your next gathering, why not take things to the next level by creating some fun margarita jello shots that are not only delicious, but are pretty to look at as well? Start by making the jello, which involves combining the pre-packed mix with the boiling water. Once mixed well, slowly incorporate the remainder of the ingredients before pouring into small cups or plastic shot cups. Pop them into the refrigerator for at least five hours, or until jello is firm and completely set. Bring out of the fridge and serve once your guests arrive! Once again, start by making the jello by combining the packet with a cup of boiling water. Then, in a bowl, mix the jello with the orange liqueur and tequila. Next, slice the limes in half lengthwise, scooping out the insides so you’re just left with the skin of the lime wedges. Then, place the skins into a mini muffin tin to hold them in place before pouring the jello mixture into each wedge. Refrigerate for a few hours until the jello is firm, then serve them up! Another fun take on margarita shots is to serve them up in cored strawberries instead of cups or lime peels. 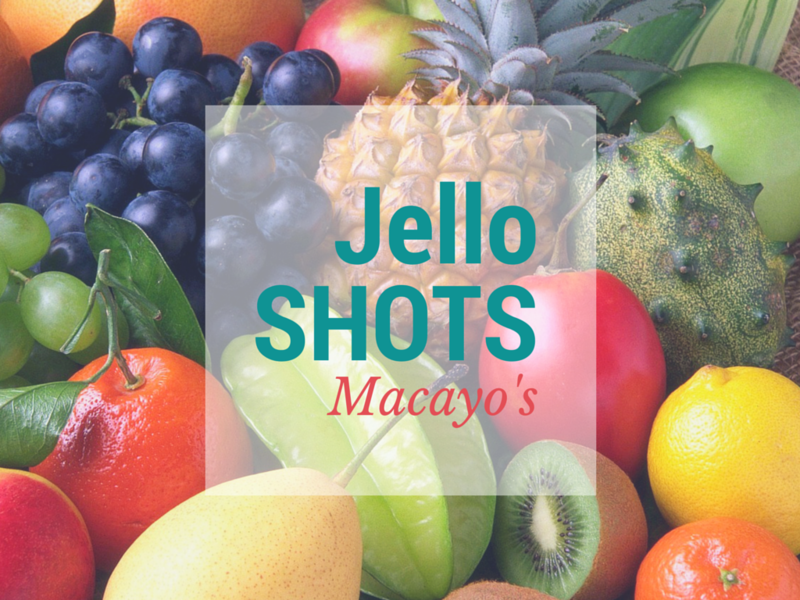 You can use the same jello shot recipe as above. The only thing you’ll need to do differently that you’ll need as many strawberries as shots. Carefully using a sharp knife, cut off the top of the strawberry along with a small portion of the bottom (which will allow it to stand upright). Then, use a melon baller to scoop out the insides of the strawberry before pouring jello mixture into each one. Refrigerate for several hours, then wow your guests by serving them up. These fun margarita jello shots make a great addition to your next party. In the mood for a full-fledged margarita? Macayo’s has you covered; from traditional margaritas and gourmet Mexican food to specialty margaritas (such as our cucumber cilantro margarita), stop in today to sample our new drink menu!